Aberdyfi / Aberdovey Beach BeachAberdyfi, one of Gwynedd’s most attractive coastal villages, stands in an idyllic spot where mountains meet the sea at the mouth of the River Dyfi. The popular beach of perfect sand and the occasional sand dune extends for miles, from Aberdyfi all the way to Tywyn. Even though the sea looks inviting, swimmers must take care while venturing out, due to the strong currents around the estuary mouth. Aberdyfi was once a working port. Nowadays, the sailing craft concentrate on leisure and pleasure – Aberdyfi is a busy sailing and watersports centre, and scenic boat trips run from the harbour. Aberdyfi’s southern shore along the Dyfi Estuary is part of the Dyfi National Nature Reserve. This untouched area, a haven for wildlife, is also a Ramsar site (named after the convention that encourages wise use of the world’s exceptional wetlands). Parking with charge. Dog restrictions apply April to end September. 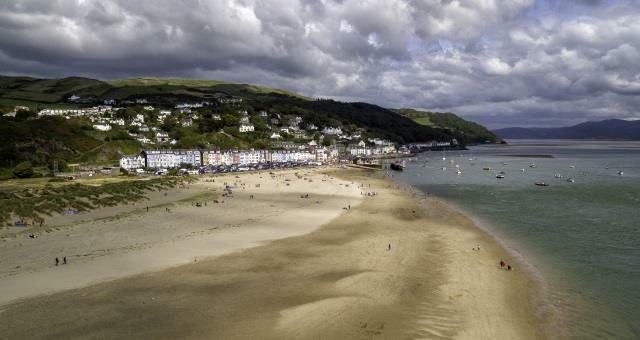 Aberdyfi, one of Gwynedd’s most attractive coastal villages, stands in an idyllic spot where mountains meet the sea at the mouth of the River Dyfi. The popular beach of perfect sand and the occasional sand dune extends for miles, from Aberdyfi all the way to Tywyn. The village is on the A493 west of Machynlleth.